I redesign my fine art website every few years to keep things fresh and new. For this version I wanted the look and feel to be clean and minimal but elegant. For my masters thesis show at Tufts University, I had to design my show card. I wanted it to be clean, simple, and elegant. In addition, I wanted to really utilize them as actual postcards, as well as an art postcard, so I made them functional but also keepable as a souvenir. eLanguage, LLC is a Northern California-based leading developer of language learning products. The company's products have been designed by language experts to quickly teach a foreign language based on a building-block approach. speech bubble with the "e", was prominently and tactfully featured on all business identity collateral. Cosmi annually has a booth at the Electronic Entertainment Expo (E3). I designed the banners for the company's kiosk one year. 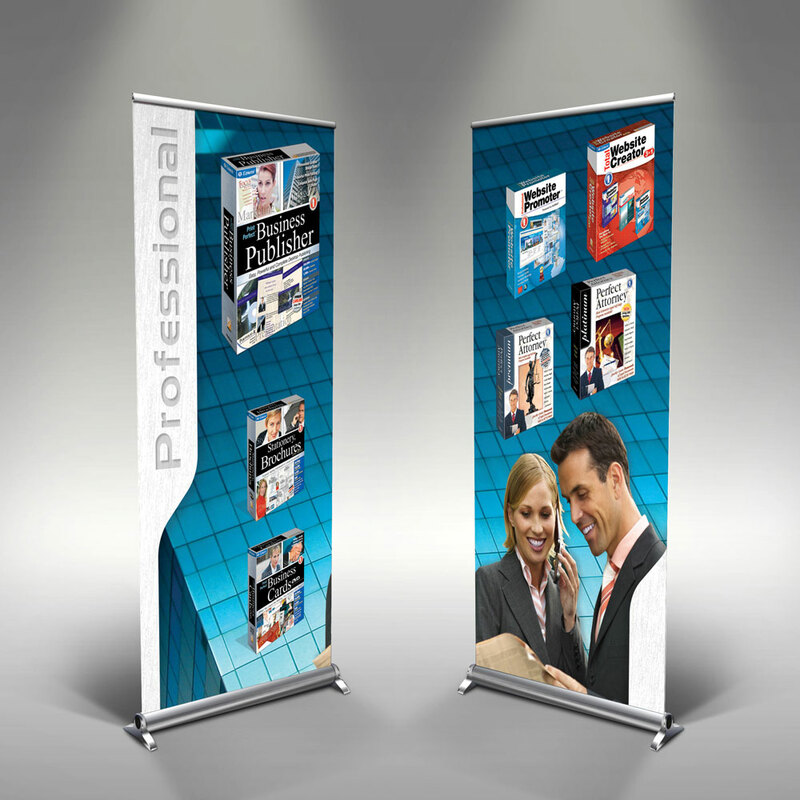 This banner features the company's professional line of business software. I used the glass exterior of an office building as the background, and arranged the products floating in front to highlight them. Brushed steel tabs flank the banner's sides to emphasize strength and stability. Cosmi Corporation's website needed a major redesign. The Cosmi art department team came up with countless different designs. In my design I featured the "swoosh" of the spiral in the Cosmi logo into the background of the site, as well as featuring the variety of products the company produces. While working in Cosmi's art department, I conceived and created the packaging for this suite of website creating and promoting software. The image of the globe on each of the boxes was featured to emphasize the concept of the world wide web. 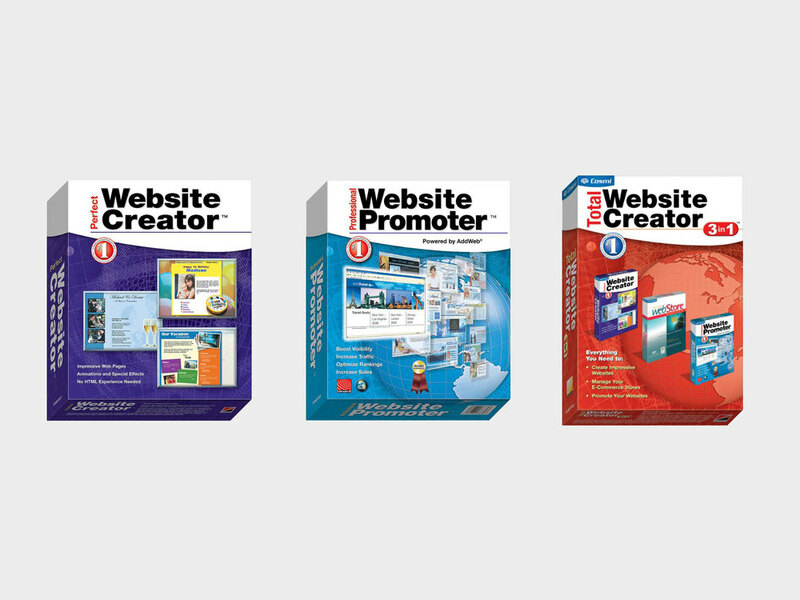 I also helped to create and design the little mock websites featured on each box. Timo was a mock ad I did for a UCLA extension graphic design class. It was one of those assignments where we weren't given very much, just a name, some body text, and one photo. I was pleased with how a simple but elegant ad could convey class and minimalistic design with very few elements. Mono was a British electronic music duo in the late 90s, whose claim to fame was their hit song "Life in Mono", which was featured in the film adaptation of Great Expectations. Their music is described as trip hop, similar to electronic music contemporaries such as Portishead and Sneaker Pimps. Influences in their songs include "jazzy instrumentation reminiscent of 1960s spy film soundtracks and production styles rooted in 1960s pop music". As a former avid fan, who listened to their only album for hours on end, I created a stylish mock website for this now defunct London band. Since 1965 Campus Events Commission (CEC) has been one of the largest purveyors of campus entertainment. Since its inception, it has acquired a reputation for its edgy style of advertising and controversial events. 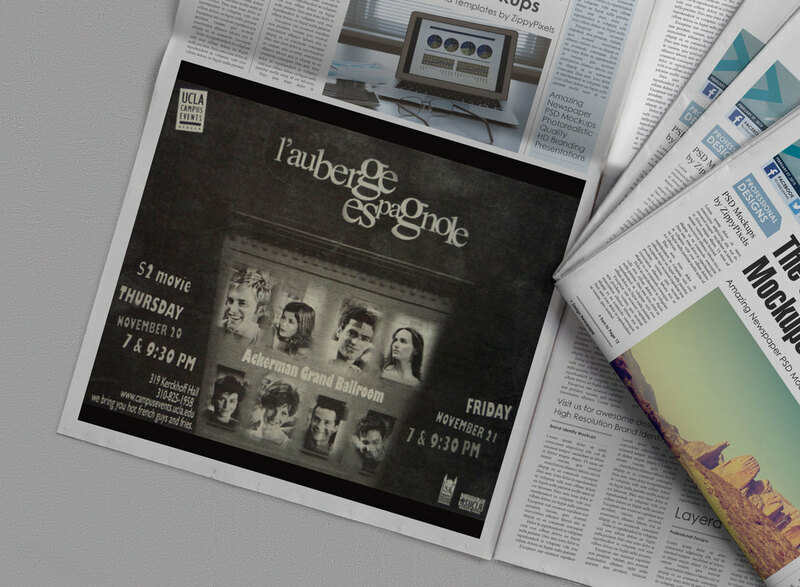 I designed the ad for that week's film screening, which was L'auberge Espagnole (The Spanish Hotel). I decided to go with a night scene with a lone hotel building and used images of stars from the film's poster to place into the windows of the building. I wanted to show the hotel as a beacon of life in the dark night.